Ben Stokes, the Durham allrounder, and Kent quick bowler Matt Coles have been sent home from England Lions' tour of Australia for unprofessional conduct. Both players had previously been issued with written warnings for "contravening their conduct obligations" on the tour and a second incident has seen them dropped from the tour party with three matches remaining. David Parsons, ECB performance director said both players had ignored directives given to them for match preparation and recovery. "On a very challenging tour to Australia, both Matt and Ben have ignored the instructions and, following previous warnings, it is regrettable that it has been necessary to terminate their involvement in the tour. "Both are very talented individuals and it is hoped that, with the support of the ECB and their respective counties, they will take positive steps to give themselves the very best chance of fulfilling their potential. There will be no replacement players called up to the squad as a result of this matter." Stokes, 21, is seen as one of England's brightest prospects with the potential to eventually fulfil the allrounder role that hasn't been filled since Andrew Flintoff retired. 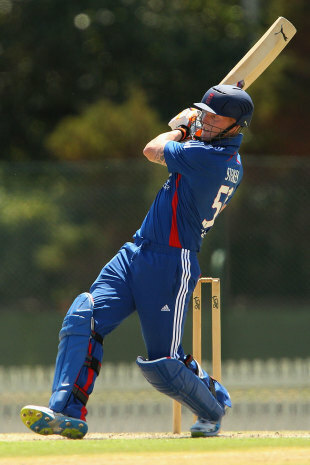 He made his full ODI debut aged 20 against Ireland in August 2011 and has played five ODIs. He played the opening four matches of the Australia tour, scoring 41 off just 15 balls in the second warm-up and took 1 for 40 in the first unofficial ODI with his right-arm medium pace. It is not the first time he has been reprimanded for his behaviour. In Decemeber 2011 he was arrested for obstructing a policeman in his duty, in what was believed to be a drink-related incident. Coles, 22, was rewarded for his excellent season at Kent in 2012, taking 59 first-class wickets at 22.35. He took 2 for 58 in the second warm-up and played the both of the opening matches against Australia A. But a lack of discipline has denied both players the opportunity to further impress the England management and created a most embarrassing situation. ESPNcricinfo understands that England team director Andy Flower has stopped in Australia to observe the Lions squad en route to New Zealand. "I would like to apologise for the way in which I acted," Ben Stokes said. "I am determined to bounce back from this situation and I regret my actions off the field. I look forward to getting back to my county to start pre-season preparations." Matt Coles was equally apologetic: "I am very sorry about what has happened in Australia," he said. "I believe I have learnt my lesson. I have apologised to the players and coaches involved, so would now like to move forward from this by looking ahead to the start of the county season at Kent." England are winless on the tour having lost all three warm-up matches and the opening two unofficial ODIs against Australia A. All but one of the defeats was comprehensive. Three more matches remain in the series against Australia A on February 22 in Hobart and 25 February and March 1 in Sydney.